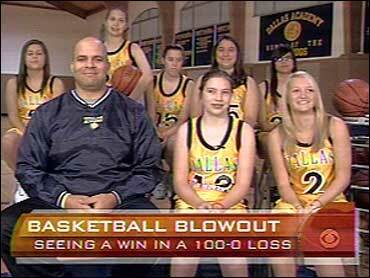 A Texas high school girls basketball team on the winning end of a 100-0 game has a case of blowout remorse, and the team on the "wrong" end of the score is being applauded for its efforts. Officials from The Covenant School say they are trying to do the right thing by seeking a forfeit and apologizing for the margin of victory. "It is shameful and an embarrassment that this happened," Kyle Queal, the head of the school, said in a statement, adding the forfeit was requested because "a victory without honor is a great loss." The private Christian school defeated Dallas Academy last week. Covenant was up 59-0 at halftime. Dallas Academy has expertise in teaching girls with learning disabilities. In the statement on the Covenant Web site, Queal said the game "does not reflect a Christ-like and honorable approach to competition. We humbly apologize for our actions and seek the forgiveness of Dallas Academy, TAPPS and our community." Covenant coach Micah Grimes did not immediately respond to a message left by The Associated Press. Queal said school officials met with Dallas Academy officials to apologize and praised "each member of the Dallas Academy Varsity Girls Basketball team for their strength, composure and fortitude in a game in which they clearly emerged the winner." Dallas Academy player Lauren Click told CBS News her team hung in there because "We're not gonna be quitters. We're gonna stick in there and finish what we started. You have to have sportsmanship. It's not all about winning for us. It never has been." On The Early Show Saturday Edition, Click added, "We never give up, so we weren't going to give up then." Teammate Shelby Hyatt said Covenant "tried really hard, just like we did, and they just happened to be better than we were." Click said, "I think they were just playing the game and doing what they were taught." Dallas Academy coach Andrew Lott remarked to co-anchor Erica Hill, "We tell them before every single game that it doesn't matter what the score is. Just go out and have a good time, because at the end of the day, it's just a game. "And they go out and give all that they have, every time down the court, and we just tell them to get better as a team and as individuals, and play hard, and that's exactly what they did and unfortunately, we were just on the wrong end of this game. "But you know, we define winning not by the scoreboard but, you know, by things that they do themselves. "We go up against some very good teams, but the girls have a great attitude, and they come out every day just joyful and happy, and it's a real pleasure to coach." As for Covenant's offer to forfeit, Lott said, "We haven't talked about it. It's something they chose to do, but you know, like I said, we don't really play for wins and losses. We go out and try to get better as a team, and try to have fun, because like I said, at the end of the day, it is just a game." A parent who attended the game told The Associated Press that Covenant continued to make three-pointers - even in the fourth quarter. She praised the Covenant players but said spectators and an assistant coach were cheering wildly as their team edged closer to 100 points. "I think the bad judgment was in the full-court press and the three-point shots," said Renee Peloza, whose daughter plays for Dallas Academy. "At some point, they should have backed off." There is no mercy rule in girls basketball that shortens the game or permits the clock to continue running when scores become lopsided. There is, however, "a golden rule" that should have applied in this contest, said Ed Burleson, the director of the Texas Association of Private and Parochial Schools. Both schools are members of this association, which oversees private school athletics in Texas. "On a personal note, I told the coach of the losing team how much I admire their girls for continuing to compete against all odds," Burleson said. "They showed much more character than the coach that allowed that score to get out of hand. It's up to the coach to control the outcome."